Acknowledgement: Many thanks for my fellow Trekaroo Guroo, Jen Reyneri who interviewed the geologists quoted, gathered valuable resources for further enrichment that populate our booklist and Pinterest Board, and shared updates of Hawai’i Volcanoes National Park from her 2015 trip. Also, special thanks to Leslie Gordon, Public Affairs Specialist/Geologist at the Office of Communications and Publishing for the U.S. Geological Survey. She kindly arranged interviews with staff geologists who generously shared their knowledge and passion for volcanoes. There are certain experiences that stay with you for a lifetime. Visiting Hawai’i Volcanoes National Park is one of mine. In 1992, My husband and I hiked 22 miles roundtrip to the flowing lava of Kiluea. Waking up early on a sunny Hawaiian day to explore that ever-changing landscape, we began on a rainforest path which quickly gave way to a what looked like a desolate moonscape. The isolated semi-worn trail on the barren tundra was marked by rock cairns that we had to look for in the distance before moving onward. The vision of a blackened terrain with spires or fumaroles of venting steam, the smell of stifling sulfur, and as we continued on closer to the source, the sound of cracking trees falling upon each other ever so slowly after being swallowed up by the molten earth, have left an indelible mark upon my memory. While the lava source itself was not accessible (it was surrounded by lava at 700 degrees Celsius), we watched as hovering helicopters flew closer to the caldera and the molten earth sputtered up towards them. Having been advised by a ranger, we approached cautiously and kept a path clear in case we needed to make a hasty retreat. We observed the two types of lava, the pahoehoe and the a’a, which we had learned about at the visitor’s center. The pahoehoe flowed like thick red pudding in the sand; the chunkier a’a inched its way even more slowly. We saw stringy strands of Pele’s Hair (mineral threads or fibers formed when small particles of molten lava are thrown into the air and spun out by the wind) and the fruit shines left as an offering to the fire goddess, Pele. From where we were standing, the heat from the lava felt like a bonfire warming my face. At day’s end, we held a new appreciation for this creative force of nature. Visiting the volcano was truly an unforgettable experience. Fast forward 25 years, these Hawaiian memories motivated us to we take our kids to another volcanic wonderland. Yellowstone National Park may not provide the ability to see flowing lava but it certainly has its own draw: forceful geysers, bubbling cauldrons of mud, and rainbow-colored water pools are all a result of the same geothermal forces that create volcanoes. Our kids were fascinated. Planning for a vacation to study volcanoes can be quite daunting. Many travel far to see the lava flow or the associated geothermal features, but predicting volcanic activity it is not an exact science. What is here today may be gone tomorrow. Conversely, what is dormant today may be alive and well tomorrow. In most places, though, there will be much to discover regardless of the current level of activity. Not one of the volcanic places listed below is similar to another besides the shared underground rhythm of creation and destruction. Every destination has its own unique features. 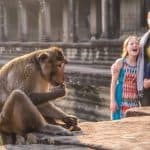 As a traveling family, they are all on our bucket list. 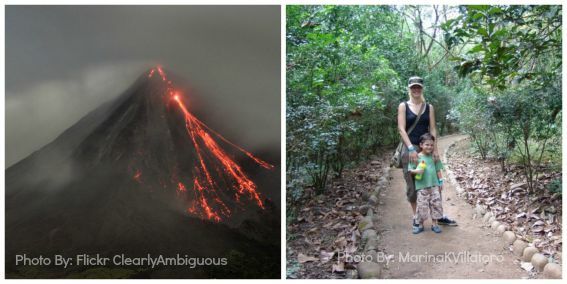 If you had to pick only one of the following top volcanoes to visit with kids, any of these will captivate! Working on an active volcano alongside other scientists—and interacting with the public—are the most interesting aspects of my job at the USGS Hawaiian Volcano Observatory. With Kilauea Volcano, one of the most active volcanoes in the world, the eruptions are always changing so there’s rarely a dull moment, which keeps my job exciting. I learn and see new things almost every day, and that makes our work interesting, challenging, and fun. Evidence of the lava flow is everywhere on Hawaii, an island birthed by volcano. A visit to the Hawaii Volcanoes National Park Visitors Center and the Jaggar Museum will provide much information on the various sites around the park and an in-depth look at Kilauea, the current active volcano. In 2015, the caldera visible from the visitors center was active for the first time in decades, exciting for both locals and visitors. However, the older crusty lava can be seen from the road anywhere around the island and there are old lava fields that can be visited. Drive the Crater Rim Drive Tour in the park for a variety of views on lava, steam vents, sulphur banks, volcanoes, and their assorted handiwork. Go underground and walk through Thurston Lava Tube, which is a giant tube or cave formed by flowing lava. While the hike I remember from 1992 is now completely different due to the whims of Pele, the flowing lava is still visible. The hike is still strenuous and not validated by the National Park Service. This agency indicates that there is no safe passage to the lava by foot. The flowing lava is about six miles out and it can be seen dropping into the Pacific Ocean from the shore. Gases escaping as the flowing lava travels as well as the danger of the hike generally preclude children less than 12 from participating. 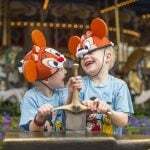 However families can still have an opportunity to see the flow. Boat tours approach the lava drops into the Pacific. 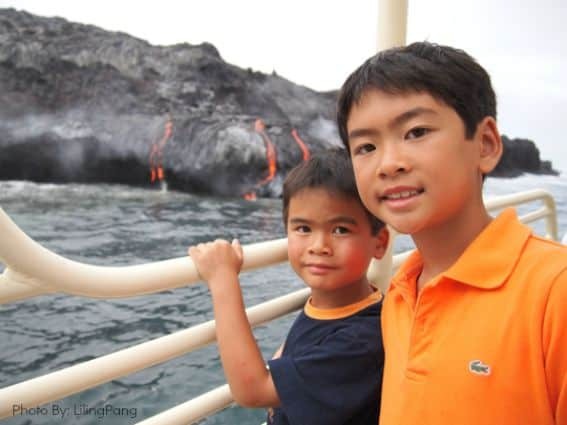 Helicopter tours also allow children if you are intent on seeing the lava flow. 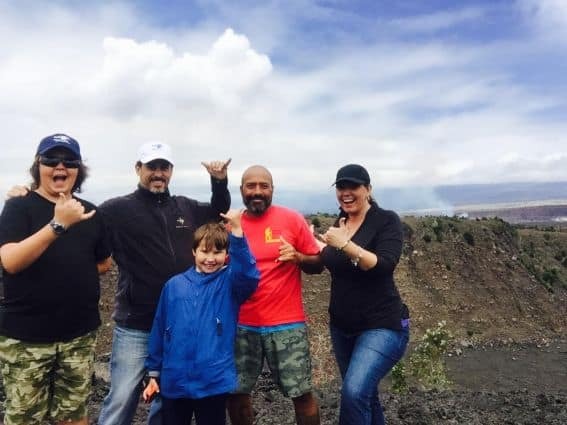 Another alternative to consider is an educational tour tailored to children such as the one run by Native Guide Hawaii tours. 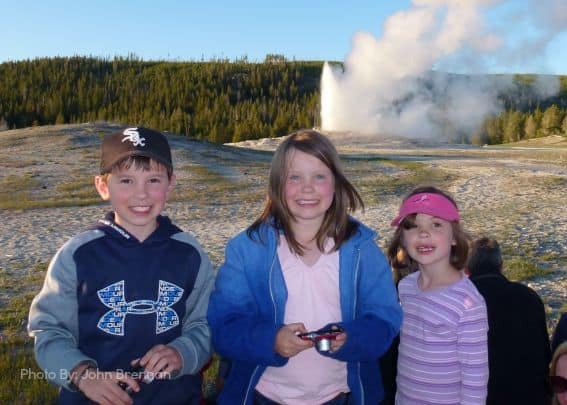 Led by a naturalist and former teacher, Warren Costa, he can engage your whole family and explain the science and geology of all the amazing features you are seeing, in kid-friendly terms. Yellowstone National Park sits atop what is known as a supervolcano. This is a large area known to have the ability to create a giant eruption. Scientists are continually monitoring seismic activity in this area where the earth’s crust is far thinner than in most other places on the globe. While the chances for a full scale eruption are not yet significant there are outward signs of underground discontent all over the park which possesses a world famous collection of geothermal wonders. Old Faithful herself is the iconic geyser that attracts significant roadside attention as do other nearby reliable geysers. You can also get off the beaten track here and find uncrowded geothermal wonders. A favorite hike of ours is the Fairy Falls trail which passes the colorful Grand Prismatic Springs and can continue on past the Imperial Geyser, Spray Geyser, and bubbling mud pots. The Cascade Range runs from Northern California up through British Columbia on the U.S. West Coast. 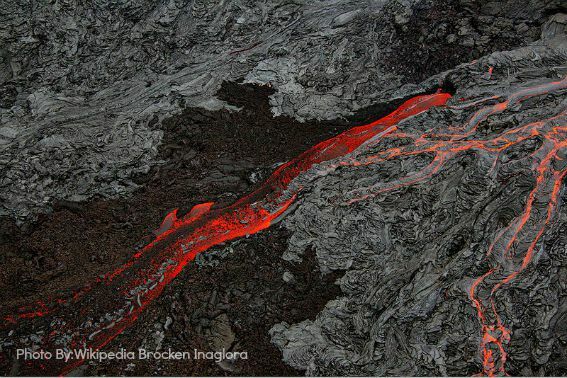 It is part of the Pacific Ocean’s Ring of Fire which is populated by 75% of the Earth’s active volcanoes. 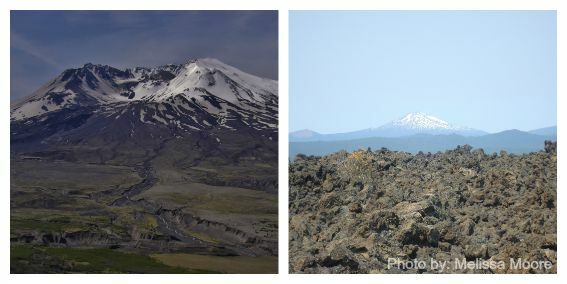 Two well-known volcanic mountains in the area are Lassen Volcanic National Park and Mount St. Helens. Lassen is home to beautiful mountain ranges, hydrothermal natural wonders, and wonderful vistas. The area beneath Lassen is still home to molten rock although the last eruption here was in 1915. Trails lead hikers past bubbling mud pots and steaming fumaroles. Mount St. Helens in the Cascades was the site of the last U.S. continental eruption and preserves the incredible devastation which took out the whole side of the mountain in minutes. The transition from healthy forest to a desolate wasteland is abrupt and a stark reminder of the volcano’s temper that fateful day. 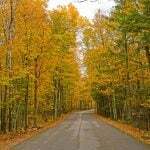 Today, the area is a National Monument operated by the Forest Service. Mount St. Helens and nearby Vancouver, WA is a major center for volcano studies and seismic observation; the geologists who work here monitor volcanic activity around the world, keeping communities safe. Families can visit the Johnson Observatory seasonally to view seismic monitoring equipment and learn about the last eruption. Hikers can choose to walk with a guide through the Ape Cave lava tube which was formed over 1800 years ago. I remember the eruption of Mount St. Helens in the 1980’s when I was an angst-ridden teenager at the opposite end of the country. I think I would have been less anxious if I had better understood volcanoes and volcanic activity! Crater Lake National Park in southern Oregon will fascinate with its giant 1943 foot deep sparkling blue lake formed at the top of an inactive volcanic crater. Families can hike down to the water and take a boat ride to Wizard Island which is an island cinder cone in the lake. Look for the Old Man which is a Hemlock log which has been bobbing in the lake for over 100 years! Alternatively, take Rim Drive all around the crater to learn more about volcanic activity at Crater Lake National Park. A drive north will bring you to the Lava Lands Visitor Center operated by the National Forest Service. Informed rangers will answer questions about past lava flows in the area. Plan on hiking through the lava fields or plan to take the shuttle to the top of Lava Butte for spectacular views. Mount Rainer National Park is the last big stop on the volcanic tour of the Cascades. It is a national park filled with the beauty of glaciers, forests, alpine meadows and the dominant 14,000 foot mountain peak, an active volcano visible for miles around. There has been no prediction of an eruption in this area, though one is expected in the near geological future. 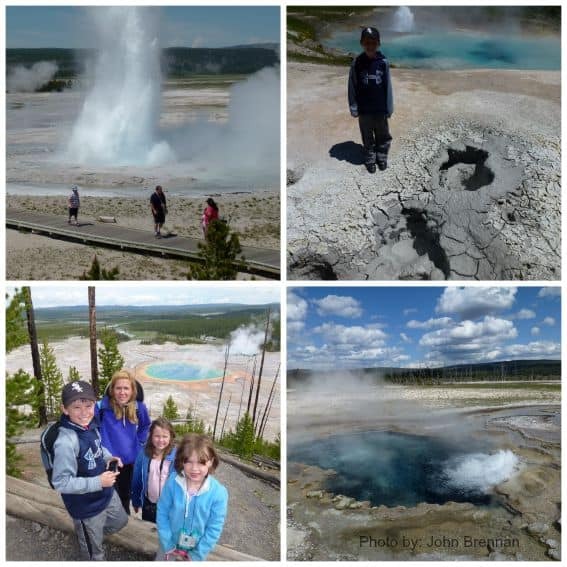 Families can still learn about its simmering volcanic activity while enjoying the supreme beauty of the park. Check out this post for itineraries and seasonal-specific tips on Lassen, Mt. Rainier, or Hawaii Volcanoes National Parks. Iceland is a renowned vacation destination. In addition to many glacial features, magnificent marine life, and fabulous vistas, there are over 30 active volcano systems, including the most recently active Eyjafjallajökull. While an active volcano doesn’t mean there is lava spewing everywhere, it does mean that there is always the potential for an eruption. In other words, there are many remnants of lava flow to be appreciated. The underground is very active in Iceland and its geothermal attractions are a big hit with locals and tourists. These earth warming sites can run the gamut of bubbling mud pots, geothermal baths, or geysers. Another fun fact is that in Iceland, you get to charge your phone with volcano, Iceland being the world leader in in harnessing geothermal power for its energy needs. At the Blue Lagoon families can relax in a giant geothermal spa. The namesake blue water here pumped in from underground reaches 104 degrees and is rich with minerals. The Hverir Mud Pots offer a glimpse of bubbling mud as the earth’s heat and gases escape through the silty soil. The Great Geysir or simply Geysir is THE namesake geyser, geyser being merely the anglicized form of the Icelandic word, geysir. 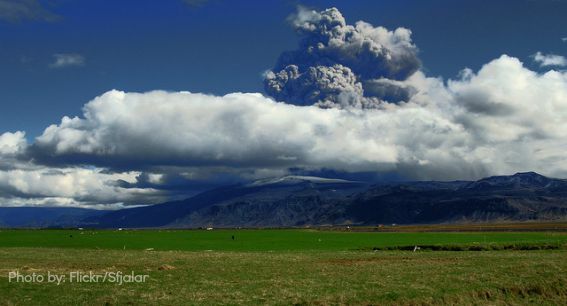 While currently it is not erupting with any regularity, Strokkur east of Reykyavik erupts every 5-8 minutes. In Indonesia, consider visiting the volcanic island, Krakatoa, one of the most notorious of all volcanoes. The last eruption destroyed most of the island and affected weather worldwide. A new volcanic mountain called Anak Krakatau (meaning “Child of Krakatoa“) was created and continues to be built due to lava flow. For the adventurous, Anak Krakatau is available to tour even as it remains an active volcano. Arrangements must be made for a boat ride to the island. Alternatively, consider staying in a nearby camp to watch the glorious eruption at night. 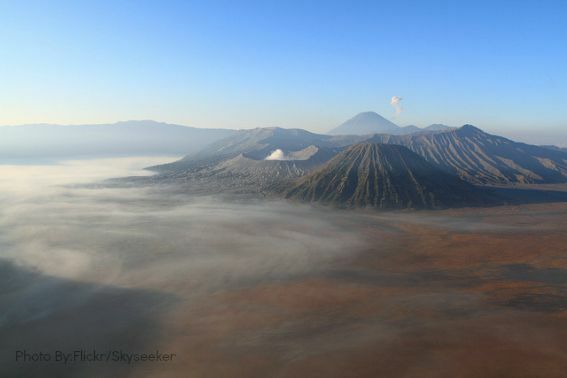 Mount Bromo is well-known and located in East Java. It’s a steaming volcanic mountain that allows for a horseback ride through the trail and a climb to the top where you will be treated to beautiful views of the surrounding mountains. Note that this is a very active volcano and at times has been closed to visitors for safety reasons. Costa Rica is known as an outdoor lovers paradise, famous for zip lines, white water rafting trips, and rainforest adventure. But there are active volcanoes there too! Arenal was very active for many years until recently. Located at the center of Arenal Volcano National Park, hydrothermal springs are a reminder of activity beneath and where you can learn more about Arenal and its volcanic activity. Although there are six active volcanoes in Costa Rica, recently Turrialba volcano has seen more frequent, significant eruptions. It is a beautiful mountain whose slopes are a lush green, being covered in tropical jungle. If its not closed because of volcanic activity when you visit, plan on at least seeing smoke rise from its top or you can hike toward the peak and see solidified lava flows along the way. When I was a child I was very intrigued by the stories and images of the pyroclastic flow of Mount Vesuvius covering the town of Pompeii. 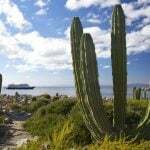 The area around Vesuvius is officially a national park where travellers today can visit. Hikers can ascend to the top of the currently inactive mountain. Visit the ruins of Pompeii nearby to view first hand the destructive potential of a volcano. 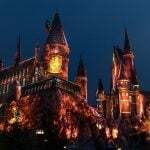 This is a designated a UNESCO World Heritage Site and one of the most popular tourist locations in the world. Mount Etna, on the other hand, is currently an active volcano in Italy. 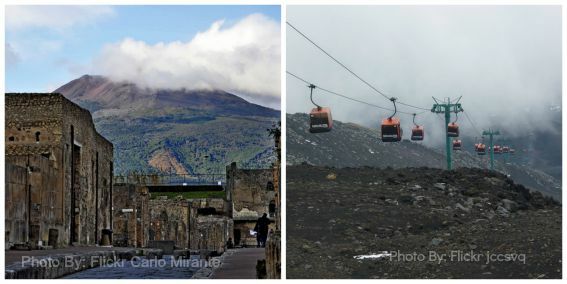 Most recently spewing up a lava flow in 2014, travelers here can find tour guides available to take them on a hike to the top of Etna to see the caldera but also to some of the volcanic rock tubes that have been created by nature and visited over many centuries by humans. Another option is a gondola ride to the top. 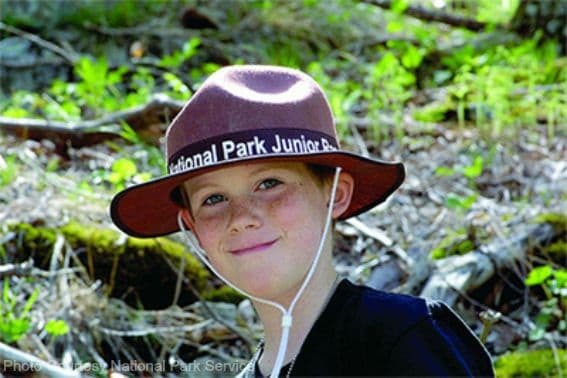 National Parks in the United States provide a Junior Ranger Program that can enhance a child’s learning perspective of volcanoes. Most parks have self-guided tours with information to explain the area and of course, rangers on hand through the National Park Services are a wealth of information. Studying up a bit prior to your visit will help kids understand what they are seeing, feeling, and smelling. Before visiting, learn about the vocabulary and geology of the earth to gain a better perspective on volcanic-related sites and to help children retain information. See our resources below for specific recommendations. Buy a rock sample kit and share the rocks with your kids. Discuss the differences between igneous, sedimentary and metamorphic rocks. Try to find a sample of the low density volcanic rock, pumice and show your child a floating rock! Websites are available to watch the seismic activity at certain locations. Please see our Pinterest Board below. Remember to be safe near geo and hydrothermal areas. Watch children as vents, bubbling mud pots, and streams can be hot and very acidic, a deadly combination. Also the colorful edges of some of the pools are caused by bacteria. It is not a good idea to come in contact with any of the water. Enjoy the wonder and beauty from afar. Prepare the family with the knowledge they need prior to a trip or get a refresher afterward to tie everything together with this volcanoes trip reading list. 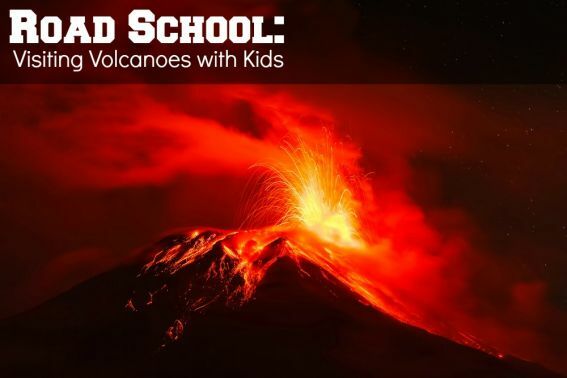 Explore our Pinterest Board with all our Volcanic Educational Resources. 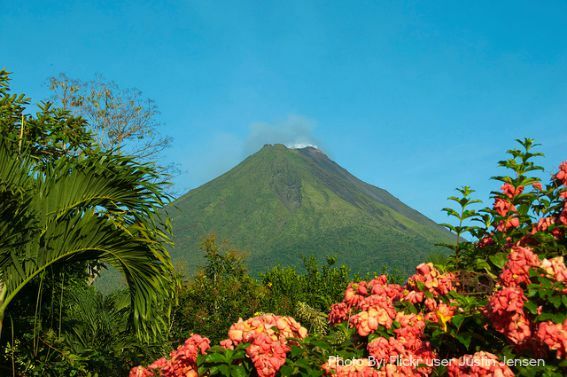 Follow Trekaroo Family Travel’s board See Volcanoes on Pinterest. I’ve always wondered if volcanoes would be a family friendly visit or not. Love the safety tips at the end. Who knew the pretty colors at the edges of some pools were caused by bacteria? I wonder if helicopter rides over volcanoes would be fun for tweens? So much mystery around volcanoes and so much to learn!